I've been meaning to ask Jen Ramos if I could share some of her work with you for the longest time, and I finally emailed her about it over the weekend. She was so sweet about it, and I'm so excited to show a small section of her original work off. It's a huge possibility you've already heard of Jen. She's the owner of MadeByGirl, her online print and accessories shop, as well as Cocoa & Hearts, her relatively new art business. I love that her style is easy to recognize...those bright, playful colors will catch my eye any day. Not to mention, I love the way she photographs her artwork. LOOK at that sunlight streaming in against the white backdrop. I could stare all day. What about you? Oh I love it. It's so simple and peaceful. Hey the feature looks lovely thank you so much! oxox! These are amazing! I especially love the first and and last! Was the first featured on DLF for a colorfast post? 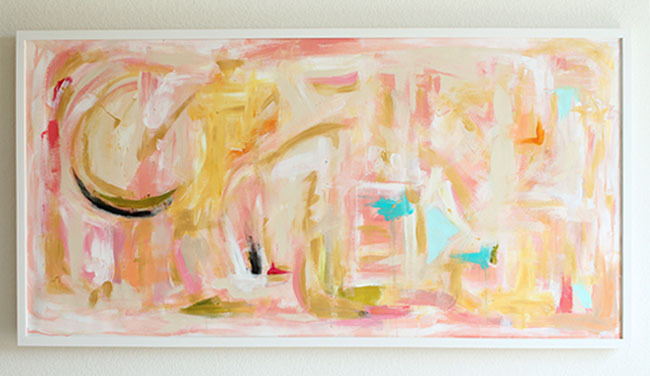 Either way, these painting are just beautiful and offer so much inspiration! Sarah: Ah, me too. I think the simplicity is so striking. Jen: Thank you so much for letting me share your work again! You're a big inspiration! Sarah: Aren't they? Those were my top picks also! I think it was. I can't remember if it was the exact same painting, but Jen has a lot of small paintings with the strips of color. I feel the same way. Simplicity always seems to draw me in. Beina: Thank you! I love it so much too. :) Aww, thank you again! You're so sweet. I love her work and her blog. so inspiring. and I love that she recently moved to NY too. I can't wait to see how the city inspires her. Monica: She's one of the first bloggers I started to follow. Love her work too! I know, isn't it awesome? I can already tell she loves it so much. I'm excited to see what she continues to create! I'm sure the city has a lot to do with her inspiration. I love that her fashion is easy to acknowledge...those vivid, playful colors will catch my eye any day. To not mention, I like the way in which she pictures her artwork. LOOK at that sunlight streaming in in opposition to the white backdrop.